This review of Miracle Foot Repair for Dry, Cracked, Itchy Feet seeks to highlight the pros and the cons of using this product and helps the consumer make a wise purchase decision. The product aims to get rid of itchy feet and provides soothing care. It is available on the product’s website as well as on other shopping websites. Read on to find out more about this product. Mehthol is the only active ingredient in this cream and it helps to relieve the itching and the pain that is caused by skin irritations therefore making it an effective cream to use on foot fungus. One needs to wash their feet and wipe them dry, then apply this cream liberally all over the itchy areas, including between the toes, the soles of the feet and then let it dry. One can apply this cream three to four times a day. One needs to consult a doctor before using this on children below the age of 2. It is an external application cream and should not be consumed. One is supposed to avoid contact with the eyes. It is advisable to consult a doctor if after seven days, the condition worsens or if after applying this cream, the problem returns. There is only one price at which it is available on the product’s website and that price is $39.99. Whereas on shopping websites like Amazon, the product is priced at $29.99 but includes shipping charges. There are no guarantees that have been provided on the product’s website. There are no reviews given on the website but on other shopping websites, the reviews are extremely positive and the customers are happy with the results. 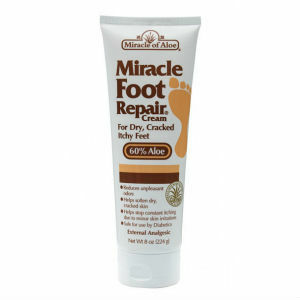 Miracle Foot Repair for Dry, Cracked, Itchy Feet comes across as a product that delivers what it promises. The customer reviews are positive and the ingredients that are used in this cream do not cause damage to the skin. It provides clear and easy instructions for use and application. On the negative side, the lack of a product guarantee from the manufacturer, as well as when it comes to returning the product and refunds, the manufacturer not providing any form of certainty. This is a serious risk a customer has to take. The price at which it is being sold at is very high, considering that such a product does not provide a guarantee. One needs to be careful when using this product on children as the strong ingredients can cause harm to the sensitive skin of the children. Jimmy Rodriguez	reviewed Miracle of Aloe Foot Repair	on November 19th	 and gave it a rating of 3.